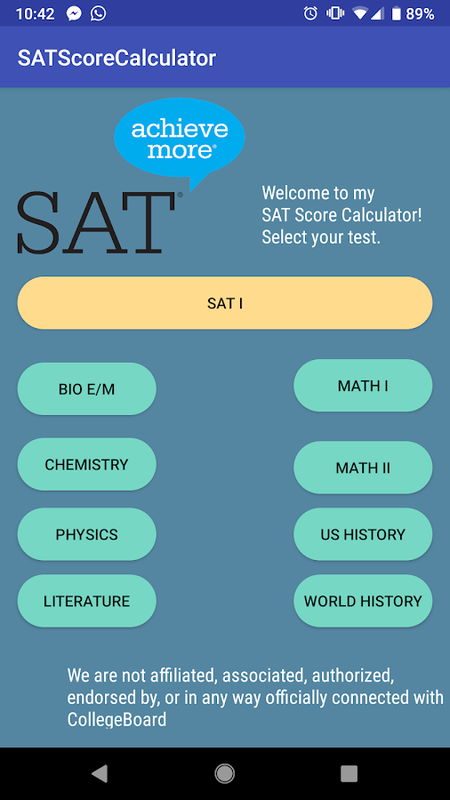 Input the number correct and incorrect, and this app will deliveranapproximate score on your SAT in a refreshing UI. The app willtakecare of both the main SAT I test, as well as Subject Tests.Thesubject tests for Physics, Chemistry, Biology E/M, Literature,USHistory, World History, Math I, and Math II haveincludedfunctionality. More exams may be added in the future.Please keepin mind that the curves vary from test to test, so thisapp cannotguarantee 100% what your exact score is. Your range ofscores is±30 of the given score here. So it's pretty darn close.Good luck!